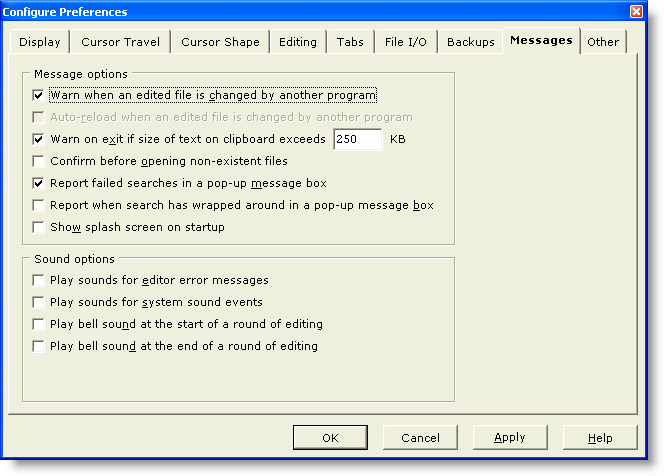 The Messages page of the Configure Preferences dialog box contains options which relate warning messages and sounds. Use this option if you prefer to be warned before a binary file is loaded. Binary files contain the Null character (value 0) and cannot be reliably edited with Boxer. You may wish to use the Open Hex Mode command to view such files in a hex format viewing mode. Boxer will automatically use Open Hex Mode when asked to open files with the extension .COM, .EXE or .DLL. Use this option if you would like to be notified by Boxer when one of the files you are editing is modified by another program or process. If this option is checked, a dialog box will appear offering a chance to reload the file from disk. If this option is unchecked, notice will NOT be provided when an edited file is modified by another process, and the file will NOT be reloaded.. Proceed carefully in a situation such as this: changes you have made to the file may be lost when you reload, or saving your file again could overwrite changes which were made by another user. Use this option if you would like Boxer to automatically reload a file (without issuing a warning) when it senses that it has been changed by another program or process. Consider carefully the effect of this option: if changes have been made to a file within Boxer and have not been saved, they will be lost if the file is reloaded. This option is used to present a warning on exit when the size of the text on the clipboard exceeds the designated threshold. When excessive amounts of text are left on the clipboard, system performance can be impacted. This option controls how Boxer reacts when asked to open a file which does not yet exist. If this option is active, a dialog box will be presented to confirm that a new file is to be created. An option is provided to correct a typing error, in case that was the cause for the file not being found. If this option is inactive, Boxer will create a new file using the name provided. This option controls how Boxer will report a failed search. If this option is active, a popup dialog box will be used to report the failure. Otherwise a message will appear on the Status Bar. When Find Next or Find Previous are used in wrap around mode, a message appears on the status bar when the search has wrapped back to the location of the first match. Use this option if you prefer that this event be reported in a message box instead. This option controls whether or not Boxer's splash screen graphic will be displayed on-screen while the program initializes. Display of the splash screen graphic can also be controlled using the -G command line option flag. Use of this option causes the system sound for Default Beep to be played for editor errors. Use of this option causes the system sounds for Minimize, Maximize, Restore Up and Restore Down to be played when these events occur. The sounds which are used for various system sounds can be defined from Start Menu | Settings | Control Panel | Sounds. Use of this option causes Boxer to play its two-bell sound to signal the beginning of a new round of editing. Use of this option causes Boxer to play its one-bell sound to signal the end of a round of editing. If your computer is not equipped with a sound card, Boxer will not be able to play the sounds described above.